These fire crackers are adapted from a recipe from Sandra Boyd. She made a batch for a party and they were a big hit. 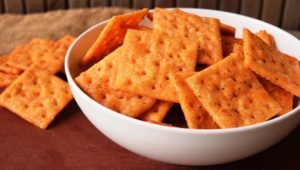 I like to make these fiery crackers during football season and top them with a slice of cheese, spread a spoonful of pimiento cheese on top, crumble on top of a bowl of chili or just snack on them plain. I use a big pickle jar to make these and roll the jar around several times to coat all the crackers with the spicy mixture. Fire Crackers Recipe Type : Appetizer Author: Angie Trusty These fiery crackers are great to make during football season. Top them with a cheese slice, pimiento cheese spread or crumble and sprinkle on top of a big bowl of chili. Place crackers in a large gallon pickle jar or gallon ziplock baggie. Whisk together remaining ingredients and pour over crackers. Gently tumble jar or baggie several times to coat spice mixture on the crackers. Angie I love the glass jar idea. The sleeves are so messy. It’s so clever and a much better presentation! Yumm! Experienced these delights at the WTMD RocknRoll Chili Bowl last weekend. These fire crackers are soooo good! I never thought to take box crackers and spice them up. Super clever!